Figure 1. Inverted Hammer pattern. This article is devoted to the Inverted Hammer two-line pattern. The Inverted Hammer pattern is built of two candles. The first candle appears as a long line and has a black body. That means it can be one of the following candles: Black Candle, Long Black Candle, Black Marubozu, Opening Black Marubozu, Closing Black Marubozu. Candles being spinning tops, even with black bodies, cannot appear on the first line. The second candle can be either white or black spinning top appearing both as a long or a short line. It can be one of the following candle: White Spinning Top, Black Spinning Top, High Wave. The lower shadow does not exist or is shorter than the body. The upper shadow needs to be at least 2.5 times longer than the body. The pattern appears in a downtrend, predicting its reversal. It has to be confirmed in the form of breaking out of a nearest resistance zone or a trendline. As always, the pattern requires confirmation on the subsequent candles, meaning the nearest resistance zone or trendline has to be suppressed. The market context in which the pattern appears is critical. The pattern can occur within the Morning Star three-line pattern, being its confirmation. Morris claims that the upper shadow cannot be longer than the candle's body. Most probably this is a typo because the book's examples present candles with shadows significantly longer than the bodies. Presumably this error has been noticed by Bulkowski because although not directly, he mentions that there are different definitions of the upper shadow. Figure 2. The occurrence of the Bearish Tasuki Line stopped the uptrend, which has a support zone created by the Long White Candle (high volume). The market is trying to defend itself against the bears within the support area and the Bullish Harami appears. Shortly, however, the powerful Long Black Candle formed at a high trading volume suppressed the trendline. In such context, the Inverted Hammer pattern occurred which second line is the High Wave basic candle. The pattern is formed at a small trading volume. The following Black Candle, appearing at a higher trading volume, cancels the pattern. Figure 3. 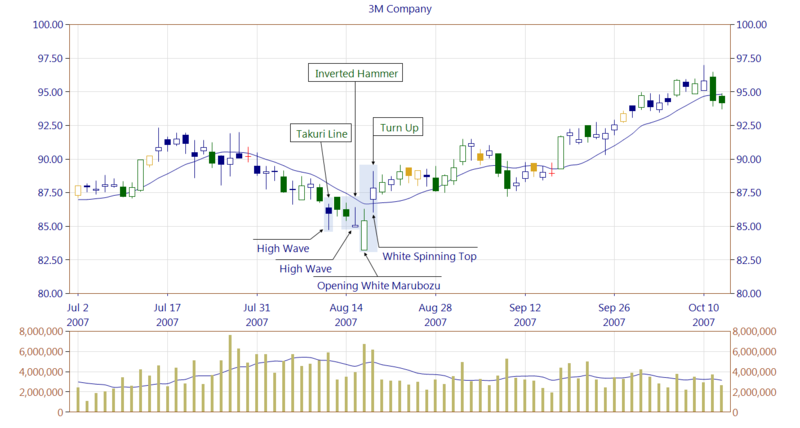 A sign of a true forecast of the Inverted Hammer could be noticed already when the Opening White Marubozu appeared. Its high volume and length create a very strong support zone. 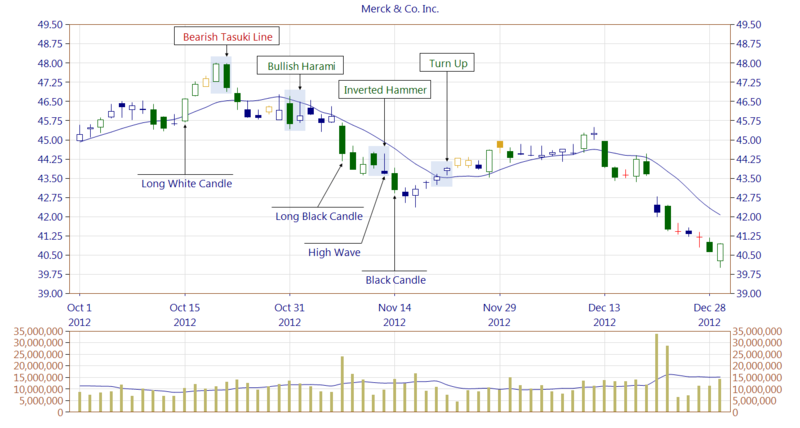 The White Spinning Top basic candle, being the second line of the Turn Up pattern confirms the Inverted Hammer. 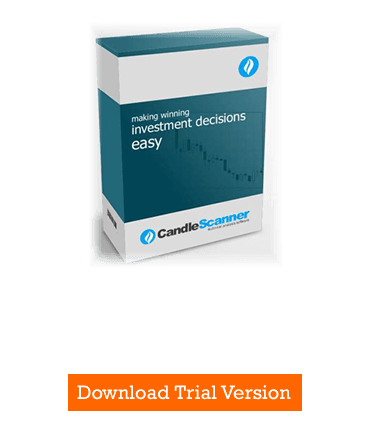 Below you can find some Inverted Hammer pattern statistics calculated by CandleScanner software. To see more detailed statistics, for other markets and periodicity try our CandleScanner software.